The transformation of this antique french armoire into a sewing cabinet has been months and months in the making but I think it's the best dang (math) project I've ever done. Not that I'm mathematically challenged. I just don't challenge myself mathematically -- that's all. But for this one, I had to rip out the old count-u-la-tor and a few extra brain cells to get what I wanted. The "fit" had to be exact and I'm not sure how, but I got it on the first try -- but just barely. The problem was I needed the table to be as large as possible but still fit inside the cabinet. Oh, and I wanted the doors to close, too. Pesky doors. I used just one sheet of birch plywood, three piano hinges and drop leaf table hardware I found on the internet. I had to lift up the back end so the height was right. I added a yardstick to the front edge for convenience. And then I added a few bells and whistles. Hooks on the back wall hold templates. Then I hang them in the cabinet when I need to close the doors. or check out my sweet hostesses on my sidebar! lindy, that is awesome!!!!! what a great way to conceal your workspace- love love love it!!! triple love! Holy schmoly. I agree that this is one of the best math projects I've seen, too! What a great way to store your sewing stuff. Wow. I LOVE this!! What great storage. And oh my, the girls are adorable. One word: Sa-weeeeet! Nicely done, lady! What an awesome project! You did great! The guest room looks gorgeous too. BUT I have to say the best project in this post is the twins! They are the prettiest! Lindy- this is so smart! I too have my craft area in the guest room and love how you stored everything in that pretty cabinet so it can be tucked away. Super Duper! Going to show my Husband, he likes anything that might organize me! Adore those little Grand-dollies of yours! Great work!! I would be totally beyond challenged and completely disabled when it comes to a project like this. Lindy what an awesome idea!! I absolutely love your twins guest room. The twins are precious as they can be. This cabinet is amazing! I am so impressed! And I love the hanging fabric storage, too. It is so great to see what you did with the armoire. My sister and I were just discussing how to do one yesterday so I know she is going to be excited to see yours. Great job!! Can I come stay in that room? It's just gorgeous!!! What a genius idea! I have an old armoire that is sort of falling apart, and I so want to fix her up again and put her in my daughters room. Your guest room gave me so many ideas! Thank you so much for sharing this. Wow ... what a FANTASTIC cabinet you've created! I can't believe what's hidden behind those beautiful french doors - A sewing workshop ... complete with sewing machine, cutting table and notions! LOVE IT! Great way to conceal your sewing station. I love when beauty meets function. I love how you can just close it up and everything is out of sight. The color is stunning, too! this truly is a magic table! How wonderful. Beautiful and yet so functional. Great job! The twins guest bedroom is adorable. Beautiful pics. Lindy that is super awesome. Sigh, you're so very talented. Very functional and the twins are super adorable as well. Love that room. Wow!!! Your table looks FAB!!!!! Love your guest room too!!!! Most of all the babies are just adorable!!! Oh...I need one of these. If I had one, I would sew more. I absolutely hate dragging out all the sewing stuff. I hate it so much that I never sew. I drug it all out this past summer and sewed a little and then packed it all away again. Plus this armoire is so pretty too. THis is amazing Lindy!!! 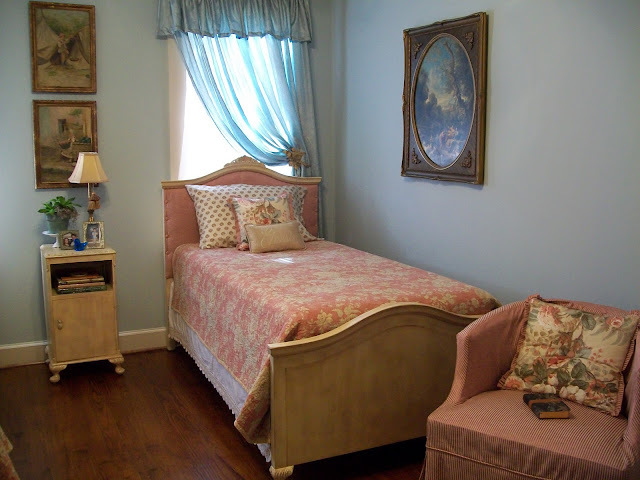 You really did a great job on this and love those matching bed and the headboards, perfecto! that is ridiculously fantastic! superb job, dealing with those pesky things like measurements and exact fit! Wow...what a great project! The bedding and the babies are beautiful! You are a GENIUS!!!! Looks fabulous too! This is so great! I would never pack up my sewing though, I've fallen in love & it takes everything to clean off my grandmother's table when I get done. She bought me one for xmas & is helping me out a lot! Love the room decor too! they must feel so special! This is so inspirational. I see these types of cabinets for sale on craigslist a lot. Especially with flat screen TVs becoming so popular. Definitely a project to consider this summer. Bells and whistles indeed! That is fantastic. It's like a furniture transformer! Mom of boys here. I love all the extras you did for it too. Your grand twins are so darn cute! Man, Lindy, that is a great piece. You did an incredible job! What a beautiful and functional piece. You did an awesome job transforming the armoire! Very impressive. Wow! Your sewing cabinet is wonderful. Great job! Your cleverness knows no bounds! I love the whole project. And I liked the creative way you addressed the hanging storage issue with the childsize hanger! You've created a wonderful sewing cabinet! Bravo! That is the coolist thing I've ever seen. Wow! I can't get over it. Way to go girl! Brilliant! The room is so pretty and you are one exceptionally creative woman! I repurposed a media cabinet to "house" my sewing machine and supplies last year. The thought crossed my mind (for a split second) to have a fold out table but it just seemed too complicated and like too much work to me! Excellent job! I think the person who wrote Narnia was inspired by this armoir - there's a whole world in there! I love love love this! Wow, great job. I love the bedroom too. So pretty. Wonderful post. What a fantastic idea! You would never think there was a sewing table hiding in there. Your sewing armoire just takes my breath away. I'm ready to throw out everything in my sewing room and start over! Great job! Wow! That is truly amazing. I love the cabinet and was sitting here thinking you were awesome, then you really stepped up and blew me away with the beautiful bedroom! AMAZING! What an impressive project! I love that piece and your use of it in hiding your sewing area. Perfect! Lindy, you are a very smart coming up with that idea. What a great way to have everything right there ready to whip out and use and then it all goes back so neatly. That guest room for those adorable twin grands is amazing. I love the twin beds and love the fabric on the headboards. Such pretty beds! Thanks so much for joining the party! I am adding your blog to my blog roll so I can keep up with your wonderful ideas. Wow!!! That is incredible. Keep up the great work! I'm swooning. I want you to know this got emailed to my husband!! New follower, btw! Words fail me-I am floored at this one! GREAT!!! Oh my goodness. I want one! Sure beats sewing on the kitchen table. I saw you on tea rose linky party, I want to congratulate you: that's an awsome job!! Now I know what to do with the armoire in my living room that I refused to sell on Craigslist simply because we sold the TV that was in it. I knew it would come in handy for something. This project is now on my future to do list! You did an incredible job on that cabinet! I also loved seeing the pics of the bedroom. Precious little girls too! Beauty and Brains!! Loving it! How very clever! I love that you added the yardstick. You will use that I know! what an incredible use of space!!! Wow--I am speechless, very impressed and a new follower. Great Job!!!! This is simply brilliant! Brilliant, I say! I'm at a loss for words. 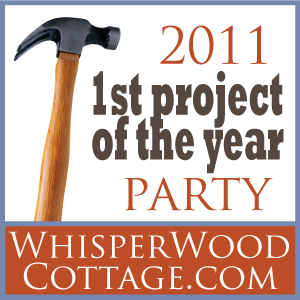 So glad you linked up at the 1st Project of the Year Party at WhisperWood Cottage! P.S. Please add the party button to the post itself so that you are eligible to win and be featured! Thanks so much! All I can think of to say is "WOW". I love this..I have wanted to make something like this..
Lindy, I am always at awe of your creativity. This is fabulous..absolutely fabulous! I found your blog from Blue Cricket Design and I love, Love, LOVE it!!! One day I will make something like this! How impressive! I love it! You did such a nice job on this and it looks as though it was well thought out. Your granbabies are lovely. No wonder this has received so many comments! It's awesome! I read it and at first thought, "no way!" But, you did a fabulous job! I love it! Wow! I am in awe. Not only is it absolutely gorgeous! But it is a completely functional workspace. You did an amazing job! This is so very impressive! Congratulations! I loooooove this project. Something I would have never thought of. The yard stick on the side of your table is genious! And your guest room is GORGEOUS! I think my jaw just hit the keyboard! Incredible! That is so awesome! I want one! Great job. What a great way to make your space do double duty! That fold out table is genius and really allows you to have a great workspace when you need it...but put it away when you don't! I love it! Visiting from Miss Mustard Seed's party! You are so clever to have fitted that all in there so beautifully! I love it. And your room decor is gorgeous too! FABULOUS!!!! the cabinet and the bedroom!! both gorgeous!! Thanks for linking up to I'm Lovin' It!! That's pretty amazing. You did a great job. I linked over from My Romantic Home. The rest of the room is gorgeous too. I'd love if you would stop by my blog at www.diybydesign.blogspot.com. Thanks. Oh my gracious!! This cabinet is absolutely ah-ma-zing!! Color me truly impressed! This is fabulous!! You should hook up with Ana White (ana-white.com)...she could design the cabinet and you could provide the instructions for the interior! Great job!! wow!!!!! you are so creative with the cabinet and the bedroom looks beautiful! very talented! That is just completely awesome! I am so inspired to create a special cabinet for my sewing supplies. Thank you for sharing! INCREDIBLE! Can I have some of your brain cells? :) Your little grandtwins are darling! This is GENIUS!! I sent my hubby a link in hopes that he can build me one! Thank you so much for sharing. It's worth the wait! Now you have a pretty sewing cabinet worth showing off :) Good job! Just beautiful and brilliant, Lindy!! Lindy, I swear, every time I drop by for a visit I'm amazed. And dazzled. Dazzled and amazed! I should do a linky party for that, huh? In the meantime, how about Passion for Paint some weekend? LOVE LOVE your armoire project. And the room is just beautiful. I have an armoire sitting in my garage -- where it's been for the past 4years! Maybe I can get some math skills together and replicate your plan. Wow that turned out so cute. I love it. I need one of these. Thanks for sharing this!! I have an empty TV armoire sitting around and received a new sewing machine for Christmas that needs a home. Just showed it to hubby! Wow. Amazing solution and seriously cool. Love it. Uhm ...WOW! I clicked over from Funky Junk. That is one fabulously tricked out sewing cabinet! ..and the ROOM! Beautiful room... and precious little grandtwins! I'm going to bookmark your blog so I can return! Amazing!!! You did such an awesome job on this! Thank you for sharing at link party. My gosh. This is a stroke of sheer brilliance. I'm in LOVE with this project! It's pretty open AND closed. :) I've featured you on both my facebook and SNS #65's sidebar this weekend. Nicely done! Looks great, what a clever idea!! OMG-what a genious you are -it all stores up so nicely and it's a beauty all shut up-but it makes my heart flutter when I see it opened-what wonderful space you have-and the bonus-cute grandaughters!! Mercy this is fantastic! I love this idea! You really take the cake. Seriously! I am just speechless. I love this so much, but I also really love your pretty organizer hanging there on the door w/the ruffles. I will be back to look at this often I know! Terrific sewing center by a super creative lady! So impressed...this is just awesome!!! How clever. I am amazed by your ideas and how you made all this happen... I would need such a cabinet too, if I just would find a place for it. And I would love to be your guest in this room. Absolutely stunning! I am currently bowing to your brilliance and creativity. This is so fantastic. Another bookmarked blog for me. Oh, and the room is just adorable! This is awesome! I love love the idea! What a great way to hide the mess of a work space in such a beautiful cabinet! Well done! That is brilliant!! I got here by way of Sachiko :) I'd never guess that by looking at the outside, my favorite toy in the world would be hiding inside :) awesome! What a great idea!!!! You did an amazing job! Wow!!! I want that! 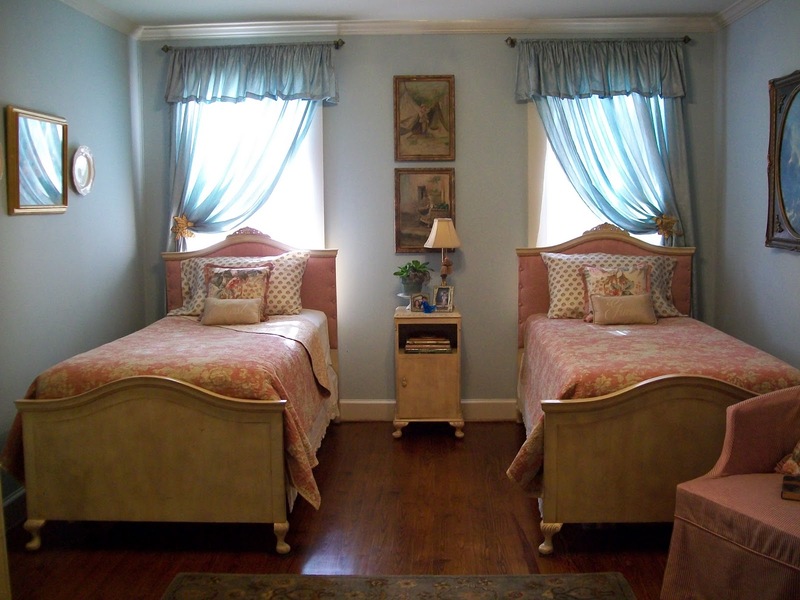 Your grandtwins are adorable and the guest room for them is so precious. I want one! I want one! I have an old tv cabinet out in the shed.... Then maybe my sewing area wouldn't be the Pit of Despair anymore! This is incredible, Lindy! First of all, I love the piece itself, but you really put a lot of thought into how to use this to the best way possible. Kudos to you! The folding table is genius. This is such a great idea, especially for those who can't dedicate a room to sewing and even then, it keeps it neatly packed away until you actually need to sew. I also love your organizer! I had to take a double take when I saw what you created. Back in old 1979 I ordered prints for a cabinet to build that reminds me of this, except it wouldn't have been this stylish! That is quite the invention you made! Kudos.... P.S. mine never did get built! Let me be the 138 person to say wow that is awesome. And what a beautiful room! What an amazing transformation! It looks wonderful, and so practical!! That workspace is genius. Very well done! and the twins are absolutely beautiful! Love the room. Wow....this is beautiful! You must love to sew there! Very unique! I covet your cabinet! It's very pretty and a great idea. Awesome cabinet redo! Love it. wowww, this is amazing I'm have not words!!! This is the most amazing blog project I've ever seen! I am utterly impressed. What a genius you are. I want! I've been searching for the perfect sewing table and never dreamed of creating one from an armoire. You, miss Lindy, are brilliant! Love, love, love your creativity. Can't wait to read more of your posts! Thanks for linking to the party. I love seeing your marvelous makeovers! Oh, how very clever! I saw your link on the CSI Challenge. I LOVE this idea! So great! Oh my fabulousness - that is amazing. I am in DESPERATE need of something like this because all my sewing is in a closet and it is a mess. Thank you for the inspiration. And I love the beds too!!! AMAZING project!! I'm considerind do the same now. I don't have a craft/sewing room so your idea will work great for me. Thanks for sharing. Visiting from the CSI Project! COngratz! This rocks!!! I want to use this for everything! Oh, my goodness, that is the awesomest thing I've ever seen! I am so inspired. I would totally screw up the math, but maybe I can get someone to help me. I'm visiting from A Domesticated Woman's Adventures. I have wanted to make one of these for YEARS but my dear husband said it couldn't be done. Thanks for proving he was wrong! Now, armed with your wonderful example, I can go make one myself! Hmmm, where do you suppose I could find a cheap armoire??? I posted it in my DIY project blog. Thanks. THIS IS AMAZING! I called my Honey over and said "This is *exactly* what I need for my sewing stuff!" Now I'm going to keep an eye out at Good Will for nifty old pieces of furniture. Thanks for the inspiration! I loved the idea, very good. Love your math project! What a great sewing space! I love it. That is a great idea. ...absolutely ingenius!!! I love this project!!! I have this book marked on my "to do" list. Along with the tray you did. The clock you did. Just to name a few. I love, love, love this. I've tried more things from your blog than any other. So many of your tutorials are on my "to do" list. Wow! That is truly amazing! Thanks for sharing. Your GrandTwins look really happy in their guestroom too. We also have GrandTwins, but of the male variety. Not sure which room they'll get to sleep in at the renovated house yet (we're still to move in), but would be good if I could stow my stuff away as neatly and cleverly as you have done. This is really incredible. Thank you for sharing! I Finished theTrompe L'oeil Grandfather Clock!